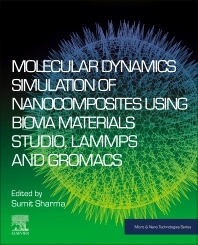 Molecular Dynamics Simulation of Nanocomposites using BIOVIA Materials Studio, Lammps and Gromacs presents the three major software packages used for molecular dyanmics simulation of nanocomposites. Materials Studio, Lammps and Gromacs are all used for performing nanocomposites simulations and analysis. The purpose of this book is to provide the readers with an in-depth view of molecular dynamics modeling of nanocomposites using Materials Studio, Lammps and Gromacs. The book explains in detail how to use each of these packages most effectively, using real-world examples to show when each should be used. The latter two of these are open-source codes, which can be used for modelling at no cost. How do I perform optimization? How do I calculate mechanical, thermal, optical and electrical properties? How do I perform scripting in Materials Studio, Lammps and Gromacs? This is the first book that explores methodologies for using Materials Studio, Lammps and Gromacs in the same place. It will be beneficial for students, researchers and scientists working in the field of molecular dynamics simulation. This book will give you a first hand experience on various softwares like Materials Studio, Gromacs and LAMMPS apart from that this book also cover various problems base on different materials in order to have a good understanding vis-a-vis designing and simulation of materials. Very good book for the beginners. This book contains good very good content to start the journey in the field of molecular dynamics. Excellent contribution for the designing and simulation of materials. The book provide detailed explanation how MD simulations work. One can buy this book to excel the commands and to learn Materials Studio, Gromacs and LAMMPS with number of examples. Sumit Sharma is Assistant Professor in the Department of Mechanical Engineering at Dr BR Ambedkar National Institute of Technology Jalandhar, India. Dr. Sumit Sharma's research interests are related to both theoretical and experimental aspects of mechanics and dynamics of the nanomaterials and structures. He is interested in the areas of experimental and simulation of nanomaterials and structures. Assistant Professor, Department of Mechanical Engineering, Dr. B R Ambedkar National Institute of Technology Jalandhar.